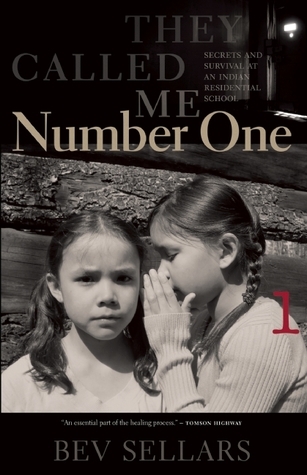 Bev Sellars' They Called Me Number One is one of a handful of residential school memoirs that I've read. Rather than getting any easier to handle however, it gets increasingly difficult. I admit that I have the luxury of pacing myself, of choosing lighter fare to read in between, and so on. While they may have an emotional impact on me, I recognize my privilege that these painful memories are not mine. It gets increasingly difficult even when many details are disturbing similar. The nuns and priests who had no experience raising children of their own and were racists to boot; the litany of the abuses they inflicted; the devastating impacts that continue to be felt today in terms of anger, mistrust, mental health issues, alcoholism, and so on. Even the small moments of solace the children were resourceful and optimistic enough to find within these conditions; these are all commonalities I've come across in most if not all the residential school memoirs I've read. And yet, as Bev Sellars points out in her introduction to They Called Me Number One, her story is uniquely hers and it is important to recognize such differences, not just in occasional details but also in her personal takeaways and the lessons she wishes to impart. I think it was this that I appreciated most about Sellars' book; her adherence to education and life-long learning. It's inspiring that she was able to retain this despite the efforts of the so-called teachers at residential school to either suppress learning and/or define it in colonial terms.